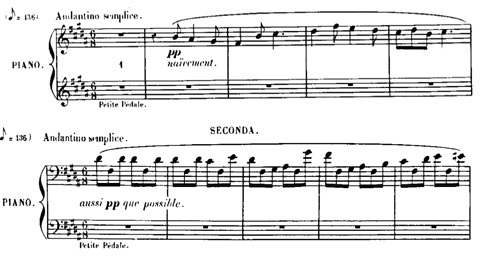 A Berceuse is a cradle song and it is thus appropriate that all the examples I have found feature a rocking between two harmonies in duple time – sometimes simple and sometimes compound. The melodic shape and rhythm of the French song ‘Do, do, l’enfant, do’ is not far away from my first three examples. This is the first appearance of ‘Do Do’ – hidden in the lowest RH notes and swathed in whole tone harmony. I have been so taken with this collection of pieces (l’almanach aux images) that I have suggested that Hyperion Records record it. It’s at least as good as some of the other obscure music they are recording. I have only been able to find one movement on Spotify and a few versions on Youtube. Let’s hope the selection of 3 pieces for recent ABRSM grades encourages more pianists to become acquainted with the collection. This is one piece from ’24 pièces en style libre’ for organ or harmonium. The melody has the rhythm of ‘Do Do’ and the first two bars have that oscillating harmony. Berceuse from Dolly Suite by Fauré – originally written in 1864 and called ‘La chanson dans le jardin’ but amended and renamed ‘Berceuse’ in 1893. Here we have a similar rocking harmony slightly disguised into a flowing bass melody instead of a series of chords. 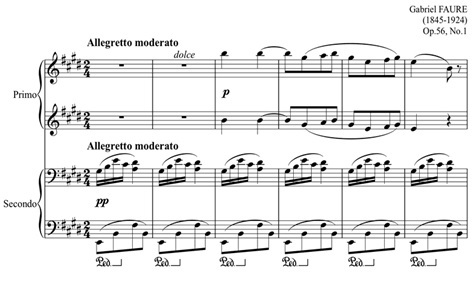 The alternating harmonies are very audible and visible and persist until the last line of the piece whilst the right hand gets even more decorated until it also subsides into simplicity at the end. This entry was posted in Piano and tagged Berceuse;Grovlez. Bookmark the permalink.